Protologue: Sp. pl. 1: 297 (1753). Kitunguu saumu, somu, thumu (Sw). Garlic is believed to originate from Central Asia (Kazakhstan, Uzbekistan and western China). This was confirmed by phylogenetic analysis based on molecular and biochemical markers, also indicating a secondary diversity centre in the Caucasus. Garlic spread to the Mediterranean in ancient times. It was already grown in Egypt in 1600 BC and is an ancient crop in India and China as well. At present garlic is grown all over the world from the equator to latitudes of 50° in both hemispheres, but is most popular in China, the Mediterranean and Latin America. In tropical Africa, garlic is grown during the cold season in the Sahel and at high elevations in East and southern Africa. It is a popular crop in the savanna zone, with a wide genetic variation in local cultivars. It is rarely, if ever, found in hot and humid lowlands. After onion, garlic is the second most widely used cultivated Allium. The bulb, composed of so-called cloves, is mainly used for flavouring meat, fish, sauces and salads, raw or cooked, or more recently in dehydrated form. Apart from bulbs, the young floral stems are also used in Spain, China and Indonesia, and whole young green plants are used too. Garlic is much valued as a phyto-therapeutic crop. Garlic users, including many African people, extol its taste and health qualities. Crushed raw garlic is strongly antibiotic, and it has a reputation for lowering blood pressure and cholesterol, and inhibiting thrombus formation. Leaves and bulbs are considered to have hypotensive, carminative, antiseptic, anthelmintic, diaphoretic and expectorant properties. Several attributed prophylactic qualities are questionable, but have resulted in a rich supply of and demand for medicinal pills, drinks and powders based on garlic extracts. World production for 2001 is estimated by FAO at about 11 million t. China is by far the largest producer with 7.9 million t from 585,000 ha; other important producers are: India (500,000 t), South Korea (486,000 t), United States (336,000 t), Egypt (215,000 t), Russia (202,000 t), Spain (179,000 t), Argentina (130,000 t), Ukraine (127,000 t) and Turkey (103,000 t). Mediterranean North Africa (excluding Egypt) produces 66,000 t, tropical Africa accounted for 29,000 t (mainly Sudan with 17,000 t, Niger 8000 t and Tanzania 2000 t), but most of the West African countries, which are producers at the scale of traditional agriculture and local markets, are not mentioned in statistics. Production areas are found in the Sahel and the highlands of Kenya, Tanzania, Uganda and Zambia, but there are no records on acreages. Production in tropical Africa is not large enough to fulfil local needs; prices in local markets are high and imports are necessary. Principal exporting countries are Spain and Argentina, and more recently China. Occasionally Mexico and Peru export too. The import-export market of garlic fluctuates highly as a result of the prices at which garlic is offered. The United States is an exporter of dehydrated garlic. The nutritional value per 100 g of peeled cloves (i.e. 79% of the dry bulb weight) is: water 64.3 g, energy 411 kJ (98 kcal), protein 7.9 g, fat 0.6 g, carbohydrate 16.3 g, dietary fibre 4.1 g, Ca 19 mg, P 170 mg, Fe 1.9 mg, carotene trace, thiamin 0.13 mg, riboflavin 0.03 mg, folate 5 μg and ascorbic acid 17 mg (Holland, B., Unwin, I.D. & Buss, D.H., 1991). When used immature, the edible portion amounts to 50–70% of the total plant weight. The flavour of garlic is based on sulphur-containing compounds collectively referred as S-alkyl-cysteine sulphoxides. Garlic is characterized by the predominance of alliin (S-allyl-L-(+)-cysteine sulphoxide), which is odourless, but on crushing breaks down to allicin (diallyldisulphide-mono-S-oxide), the principal element of the taste of raw garlic. Allicin is also instable, especially during cooking, and converts into diallyldisulphide, the principal taste component of cooked garlic. Several specific medicinal aspects of garlic have been demonstrated. In in-vitro experiments, garlic showed antibacterial and antifungal activity against both gram-positive and gram-negative bacteria (including enteropathogens), pathogenic yeasts (Candida spp.) and some skin-pathogenic fungi. In-vivo studies with rabbits and guinea-pigs showed positive results when experimentally induced dermatophyte infections were treated with a garlic extract. Tests with rabbits and rats demonstrated that garlic extract lowers blood cholesterol and triglyceride and also has antihypertensive and antihyperglycaemic effects. The best investigated medicinal property, however, is the effect on platelet aggregation. Garlic extracts show in-vitro activity against platelet aggregation. Clinical tests have been conducted (inhibition of platelet aggregation, lipid-lowering activity), but the results are conflicting or inconsistent. Regular consumption of garlic is correlated with a reduced risk of stomach cancer. Tests on rats and mice demonstrated anticancer activity of garlic and its major compounds. Erect herb, usually grown as an annual from small bulbs (cloves), up to 150 cm tall; real stem very short, formed at the base of the plant in the form of a disk, with adventitious roots at base; bulb solitary, depressed globose to ovoid, up to 7 cm in diameter, whitish to purplish, composed of (1–)7–15(–40) sessile cloves, these ovoid to ellipsoid-oblong and borne in the axil of the 2, 3 or 4–5 last leaves, each clove consisting of a protective sheath, a single thickened storage leaf sheath and a small central bud; pseudostem formed by sheathing bases of successive leaves. Leaves 4–10, distichously alternate, glabrous, with tubular sheath; blade linear-oblong, up to 50 cm × 2.5 cm, nearly flat or V-shaped in cross-section, acute at apex, smooth or crenulate at margins. Inflorescence a spherical umbel up to 2.5 cm in diameter, on a solid scape up to 150 cm long, initially curved as a crook, then coiled and eventually straight; umbel composed of flowers and bulbils or only bulbils, initially surrounded by a membranous spathe splitting on one side. Flowers usually poorly developed or absent; pedicel slender, up to 1.5 cm long; tepals 6, in 2 whorls, free, lanceolate, up to 3 mm long, greenish white or pale pink; stamens 6, usually rudimentary; ovary superior, 3-celled, style shorter than tepals. Garlic cultivars can be classified according to morpho-physiological characters into cultivar-groups which are in coincidence with categories delimited with biochemical tests, except in the centre of origin, Central Asia and the Caucasus, where a considerable genetic diversity is hidden under a rather monotonous morphology. Garlic seems to have been spread six or seven times from there to other parts of the world. A classification of Allium sativum into 4 groups has been proposed by Maass & Klaas (1995), based on morpho-physiological characteristics as well as phylogenetic analysis on the basis of biochemical and DNA markers: Sativum Group, Ophioscorodon Group, Longicuspis Group and Subtropical Group. Of these, Longicuspis Group, comprising seed-producing cultivars from Central Asia, is considered the ancestral group from which the other groups evolved. Sativum Group is highly heterogeneous (and often subdivided into up to 5 separate groups) and together with Subtropical Group includes cultivars grown in the tropics. Ophioscorodon Group, also known as rocambole or serpent garlic, is mainly grown in eastern Europe. Three groups of cultivars belonging to Sativum Group are grown in tropical Africa: the first (distinguished as isozyme type IIa) having white or pale purple bulbs, each with 20–40, small, white or pale pink cloves, erect and narrow leaves, and long and thin pseudostems, cultivated in Egypt and tropical lowlands; the second (tropical ramification of isozyme type IIb) having small bulbs, each with 10–12 small, pink cloves, grown in Senegal, Mali and Niger; and the third (tropical ramification of isozyme type IIc) having white bulbs, each with 8–12 white cloves and comparatively wide leaves, grown in cooler regions where Chinese immigrants are present. The fourth group grown in tropical Africa belongs to Subtropical Group (distinguished as isozyme type Vb); it has purple bulbs, each with 5–10 large cloves, comparatively wide, decumbent leaves, and is grown in highlands. Cultivars of this group are grown on a large scale in Mexico, Peru and Thailand. The distribution of these 4 groups in Africa seems linked to climatic conditions (lowland/highland) and contingency, except for one group (isozyme type IIb), which is characteristic for West Africa and probably of very ancient origin. Countries with the largest number of cultivars are those with the most heterogeneous human population (e.g. Réunion, where 7 cultivars have been observed). During its life cycle the garlic plant undergoes successive stages of growth and development. The dormancy of mature cloves, induced by temperatures of 25–30°C, is eliminated most quickly at 6–7°C. Vegetative growth is optimal at 18–20°C. When 12–14 leaves have been produced (when the last leaves are present, the first ones have disappeared), bulb swelling is induced at temperatures above 20°C if the day length exceeds a threshold of 12–15 hours, depending on the cultivar, and provided a ‘low temperature need’ following dormancy elimination has been satisfied. Because of this set of requirements garlic production in the tropics is more difficult than onion production. Fortunately, there is considerable physiological variability amongst garlic cultivars. Those which can be grown under tropical conditions are not strongly dormant, their ‘low temperature need’ is not very pronounced, and their photoperiodic threshold less than 12 hours. The total growing period varies from 4 months (in the tropics, or strongly dormant cultivars planted in spring in temperate countries) to about 9 months (for less dormant cultivars planted in autumn in northern Mediterranean areas). Under optimal conditions of latitude and elevation, some garlic cultivars (e.g. those from Central Asia or Spain) regularly produce inflorescences. Only some cultivars from Central Asia and the Caucasus produce well-developed flowers and seeds, provided the bulblets that occur among the floral buds are removed at an early stage. Recently a Mexican clone was discovered which behaves similarly. Other cultivars, even if they produce inflorescences under normal conditions, have flowers which remain seedless. Others do not produce inflorescences under normal conditions, but only if planted at higher elevations or latitudes. In the tropics garlic growing is possible in the highlands and is restricted in the lowlands to the cool season. Garlic prefers a light loamy soil. It strongly dislikes soil acidity and requires a soil pH of 6–7 or somewhat higher. It is sensitive to aluminium toxicity. Garlic is usually propagated by cloves, very rarely by bulbils from the inflorescence. In most areas in Africa at latitudes of 10–25° garlic is planted at the end of the rainy season. The soil should be deeply tilled before planting. Since bulbs do not grow very large in the tropics, especially in the lowlands, plant density should be fairly high: 40–60 plants/m2, or 800–1200 kg/ha planting material of cloves weighing 2 g. The cloves are planted upright at a depth of 5–7 cm. It is good practice to mulch the soil lightly with rice straw immediately after planting. Depending on soil fertility a heavy fertilization is needed, containing sufficient sulphur, e.g. 150 kg/ha of N, 65 kg P and 125 kg K for an expected harvest of 10 t/ha. A suitable fertilizing scheme is a basal dressing of 200 kg/ha of triple superphosphate during soil tillage, and a mixture of 80 kg urea, 80 kg ammonium sulphate and 50 kg potassium chloride per ha as side dressing in 3 split applications at 15, 30 and 45 days after planting. Organic matter must be used in a fully decomposed state, or should be applied to the previous crop. Garlic is very susceptible to soil acidity and aluminium toxicity, conditions which can be improved by application of finely ground limestone (2 t/ha in soils with pH <6) in the planting furrow. If grown during the dry season, garlic has to be irrigated frequently as it is shallow rooted. Furrow irrigation is preferable. Overhead irrigation can be applied during the hot hours between 11 a.m. and 3 p.m., when conditions are unfavourable for Alternaria porri. 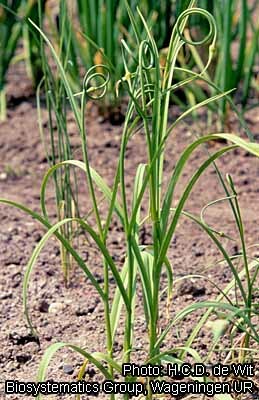 Garlic does not compete well with weeds and should be weeded thoroughly especially when young. The most important diseases of garlic are purple leaf blotch (Alternaria porri) and pink root (Pyrenochaeta terrestris). Leaf blotch is very common when air humidity is high; poor calcium nutrition and aluminium toxicity increase plant susceptibility. It can be controlled by fungicide sprays (e.g. iprodione or dithane), but healthy planting material, a low N gift, and a wider spacing may also reduce the damage. Pink root is a soilborne disease often observed in the Sahel. It is kept under control by crop rotations with 5 years without onion and garlic. The most important diseases under temperate conditions, white rot (Sclerotium cepivorum), stem and bulb nematodes (Ditylenchus dipsaci) and Puccinia rusts, are less problematic in the tropics, their temperature optima being rather low. 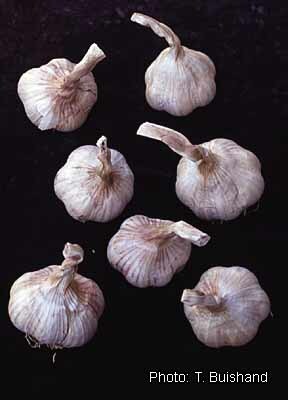 However, if introduced with contaminated cloves, white rot (optimum temperature 18°C) and, still more often, stem and bulb nematodes (optimum temperature 22°C) can appear at altitudes above 1500 m.
Every garlic cultivar harbours one and more often several viruses, the most noxious of which are the garlic strains of the potyviruses onion yellow dwarf virus (OYDV) and leek yellow stripe virus (LYSV). Their elimination by meristem culture allows a yield increase of 25–50% depending on cultivar and clone. White tip leaf necrosis, often erroneously ascribed to Botrytis, is most often non-parasitic and linked with drought and unfavourable soil conditions. Thrips tabaci is the most widespread pest, inducing a greyish striated discolouration. Thrips can be controlled by insecticides, but spraying water into the leaf-whorls, and even overhead irrigation can limit their development. Army worm (Spodoptera spp.) and other caterpillars may damage garlic leaves; however, chemical control of these insects may enhance damage by thrips because their natural enemies are also killed. Garlic leaves are occasionally damaged by the omnivorous grasshopper Zonocerus variegatus. During storage, the bulbs can be invaded by the dry bulb mite (Aceria tulipae, an eriophyid mite) proliferating between the flesh and the skin of the clove. Dusting bulbs with sulphur can control this pest. Harvesting takes place when the leaves start turning yellow and begin to dry up. This is 100–120 days after planting, depending on cultivar and growing conditions; in highlands garlic may take 150 days to maturity. If the protective bulb coats are not fully dry at harvest, bulbs are dried in the field. To avoid a bluish discoloration they should not be dried under direct sunshine and are therefore windrowed with the leaves covering the bulbs. Yields are below 5 t/ha in traditional garlic growing in the tropics. By using better planting material and proper fertilization, yields of 8 t/ha in the lowlands and 10 t/ha at higher elevations can be obtained. Garlic is packaged in bunches, braids or crates. Deterioration by sprouting and mould invasion (Penicillium and Aspergillus spp.) occurs quickly at temperatures close to 7°C . In temperate countries bulbs are stored at –2°C but under tropical conditions storage is possible in well ventilated rooms at temperatures of about 27°C. Most cultivars grown in tropical Africa behave well under those conditions. Important collections of garlic cultivars are maintained at Gatersleben (Germany), Olomouc (Czech Republic), Kagoshima University (Japan), La Consulta, Mendoza (Argentina), Lembang (Indonesia) and at AVRDC (Taiwan). A collection of West African cultivars is maintained in Mali, where they are evaluated. Tropical cultivars are difficult to preserve in temperate regions, maturing too early in spring, and being susceptible to serious frost. Selection of improved cultivars from seed produced by Central Asian cultivars is being carried out by several institutes (Japan, United States, Europe, Israel), and may give interesting results for temperate countries (virus resistance and cultivars that can be multiplied by seed). The recent discovery of a fertile Mexican clone might extend this type of research to tropical countries. For the moment, the easiest way for breeding improved cultivars for the tropics is a broad clonal selection in local or imported populations, followed by virus elimination by meristem culture. Such ‘regenerated superior clones’ may exceed the yield of original heterogeneous and diseased populations by 50–100%. A collection of subtropical and tropical regenerated clones is maintained at INRA, Montfavet, France. One of them, ‘Ramses’ (of Egyptian origin) is multiplied in France under controlled conditions, and can be grown at a latitude of 15°N (e.g. in Senegal) during the dry season provided nights are not warmer than 15°C during initial growth. Multiplication plots need to be isolated (300 m) from other garlic fields, with a crop rotation of more than 5 years without any Allium species, and should be inspected for virus-diseased plants. Even if meristem culture is not possible in local laboratories, the preliminary work of clonal selection could advantageously be done on the spot. Garlic is of increasing importance as a commercial crop, liked by consumers because of its taste and phyto-therapeutic properties. The farmers’ interest in the crop has grown considerably in recent times. African countries strive to be independent from import. Imported mother bulbs of superior regenerated clones can be multiplied two or three times in tropical countries to reduce the costs of planting material, but if economically feasible it would be better to organize their controlled multiplication in the country itself, preferably by cooperative associations of growers. An alternative would be to develop improved seed-grown cultivars, although it seems that several problems have to be overcome (e.g. bulblet development in the inflorescence, slow development of plants grown from seeds, heterozygosity). In addition, in Africa seed would have to be imported, but farmers could use it for 1 year and produce subsequent crops vegetatively, until it becomes more economical to buy new seed. Engeland, R.L., 1991. Growing great garlic: the definitive guide for organic gardeners and small farmers. Filaree Farm Productions, Okanogan, WA, United States. 213 pp. (illustr. + suppl. (1995) 33 pp.). Etoh, T., Kojima, T. & Matsuzoi, N., 1992. Fertile garlic clones collected in Caucasia. In: Hanelt, P., Hammer, K. & Knupffer, H. (Editors). The genus Allium. Taxonomic problems and genetic resources. Proceedings of an international symposium held at Gatersleben, June 11–13, 1991. Institute of Genetics and Crop Plant Research, Gatersleben, Germany. pp. 49–54. Etoh, T., Noma, Y., Nishitarumitzu, Y. & Wakamoto, T., 1988. Seed productivity and germinability of various garlic clones collected in Soviet central Asia. Memoirs of the Faculty of Agriculture, Kagoshima University 24: 29–39. Haber-Mignard, D., 1996. Inhibition of aflatoxin B1 and N-nitrosodiethylamine-induced liver preneoplastic foci in rats fed naturally occurring allyl sulfides. Nutrition and Cancer 25(1): 61–70. Lallemand, J., Messiaen, C.-M., Briand, F. & Etoh, T., 1997. Delimitation of varietal groups in garlic (Allium sativum) by morphological and physiological characters. Acta Horticulturae 433: 123–132. Maass, H. & Klaas, M., 1995. Intraspecific differentiation of garlic (Allium sativum L.) by isozyme and RAPD markers. Theoretical and Applied Genetics 91: 89–97. van der Meer, Q.P. & Anggoro H. Permadi, 1993. Allium sativum L. In: Siemonsma, J.S. & Kasem Piluek (Editors). Plant Resources of South-East Asia No 8. Vegetables. Pudoc Scientific Publishers, Wageningen, Netherlands. pp. 77–80. Burba, J.L., 1995. Panorama mundial y nacional de variedades de ajo: posibilidades de adaptación. Cuarto curso-taller sobre producción, comercialización y industrialización del Ajo. Estación exp. agropecuaria. La Consulta, Argentina. 27 pp. Le Bon, A.M. & Siess, M.H., 2000. Organosulfur compounds from Allium and the chemoprevention of cancer. Drug Metabolism and Drug Interactions 17(1–4): 51–79. Messiaen, C.-M. & Rouamba, A., 2004. Allium sativum L. [Internet] Record from PROTA4U. Grubben, G.J.H. & Denton, O.A. (Editors). PROTA (Plant Resources of Tropical Africa / Ressources végétales de l’Afrique tropicale), Wageningen, Netherlands. This page was last modified on 29 April 2018, at 18:04.